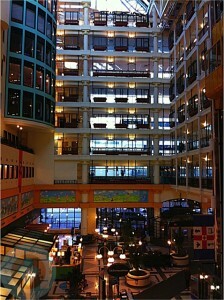 Home » 10 Days At Sick Kids Hospital = A Million Thank-yous! A trip to the emergency department with my youngest son two Saturday nights ago turned into an unexpected 10 day stay at the Hospital for Sick Kids in Toronto. Initially we visited the ER at a local hospital in my hometown where they ran some tests to determine what was happening with my son. 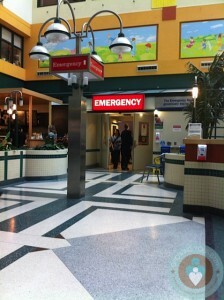 Concerned, the doctors insisted that I pack my guy up and take him to Sick Kids hospital for further testing. Even though it was 8pm on a Saturday night we got our stuff together and made the almost 2 hour trip to downtown Toronto. I have to admit that while I knew that this was one of the best hospitals in Ontario for kids, I was a little grumpy to have to travel so far for ‘more tests’. We don’t ever plan for our kids to get sick, but if they do, it was clear that Sick Kids was definitely the place you wanted to be. At midnight on a Saturday night the hospital was a buzz with nurses, doctors and various technicians. Founded 137 years ago, the hospital for sick kids has a long history of child care and research. What started off as an 11 room house with six beds has grown into a facility that has led the way for many incredible advancements in children’s health. From the moment we registered, to the moment we were discharged the staff at Sick Kids took very good care of our little man and we are very thankful to everyone for their patience with my not so patient three-year-old. This was his first stay at a hospital and he was not happy to be poked, prodded and operated on. And while he was easily persuaded with popsicles and hot chocolate, he got smart as the stay lagged on. Anytime someone came into our room, he would cry and insist I sit beside him. The nurses were great and worked to damp his fears by letting him assist with his vitals. They would check his heart and then he would use the stethoscope and check ours. After hanging out with them for 10 days, he eased up a bit and also helped pump the bulb to do his blood pressure. It takes fortitude to work with crying kids all day long and we would like to say thank you to Dr. Alsalamah, Dr. Constas and nurses, Leah, Jenna, Gayaa, Olga and Adelina. Also a very special thank you to the Ear, Nose and Throat team who worked their magic with my guy and patiently worked through a kicking a screaming toddler who was a bit tougher than they expected. I didn’t expect our trip to the ER to turn into such a journey, but I am grateful for the care my little one got while at Sick Kids hospital. Half way through our stay it was announced that the hospital had received a $40-million donation from Peter Gilgan, founder and CEO of Mattamy Homes, to go toward the construction and operating costs of the Centre for Research and Learning. This amazing gift will benefit us all and will ‘impact children’s health care on a national and international scale.’ After hearing that our son was in the hospital my husband’s company donated all of the money raised from their casual day as well. Every little bit counts when it comes to our children’s health.